Give a creature +2/+0, Breakthrough and "Slay and Pilfer: Draw a card" this turn. 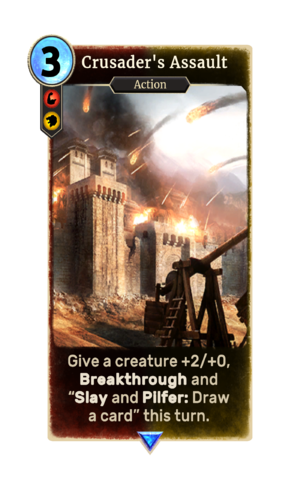 Crusader's Assault is a rare Crusader action card. It is part of the Heroes of Skyrim expansion. This card's ability applies the Kill Them All card effect.